« E’s not pinin’! E’s passed on! This IPO market is no more! ‘E has ceased to be! ‘E’s expired and gone to meet ‘is maker! Gold has outperformed the DJIA from the late 1990s to the present. 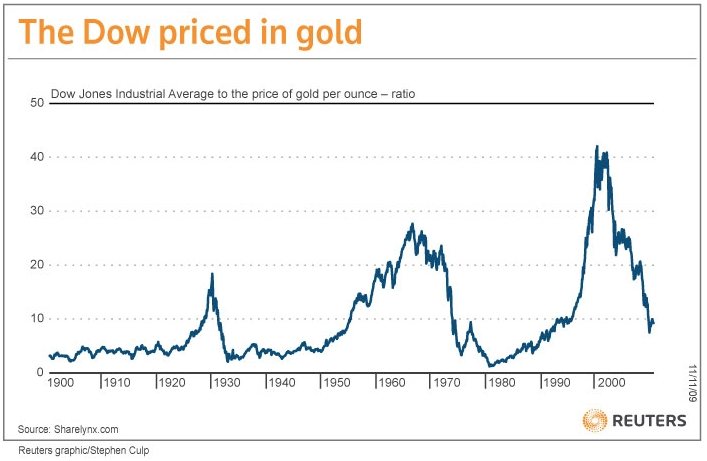 In the late 1990s the Dow was more expensive in gold than it had ever been in the preceding 100 years. WHAT are the preconditions for a bubble? Perhaps there are four: easy credit conditions, a significant trend-breaking event, the lack of plausible valuation measures and an appealing story. Gold fulfils most of these conditions. One can argue about the credit conditions; lending is still weak but crucially interest rates are low. That helps given that gold has no yield; in effect, the opportunity cost of holding gold has disappeared. The event that changed minds was the credit crunch, which caused a partial loss of faith in banks. Gold has no valuation issues (no yield or earnings); since people hold it as a store of value, it can be worth whatever they want it to be worth. And it has a plausible backstory; spendthrift governments are monetising their deficits like the Weimar Republic before them. …whereas one can say, based on historic valuation measures, that Wall Street is currently 40% overvalued, one can make no such bold statement on gold.The next stage of a bubble would be broad-based public interest. One thing clear to me from the chart is that buying equities from the late 1990s to the present was like running up the down escalator. It was fun, but it wasn’t the easiest way to get to the top. Standing still on the up escalator was an easier ride. This was the point of my Buffett on gold post last week. The change in the Dow:gold ratio for the period 1964 to 1979 makes it clear why Buffett was bested by gold over that period. The change in the ratio for the period from the early 1980s through to the late 1990s, combined with Buffett’s otherworldly ability to identify undervalued equities, also explains the lollapalooza gains made by Berkshire Hathaway during that period. It might also suggest that at some stage in the near future equities will again be the up escalator, but not quite yet, for the reasons below. In an inflationary environment a business must keep increasing the price of its goods or services just to keep its margins static, and any reinvestment in plant and machinery must be undertaken at increasingly higher prices. If it can’t increase its prices or it doesn’t earn enough to keep up with its maintenance capital expenditure, then it will shrink and risks falling behind any competitor that can. In other words, it has to run up the down escalator, and if it can’t run faster than the escalator, then it’s going backwards. Businesses with no pricing power and low returns-on-equity will therefore suffer in an inflationary environment. While it is true that a business with pricing power and high return-on-equity is better able to protect itself somewhat from inflation, it is not true that inflation is good for this business either. Since I (and, I suspect, most investors) can’t prospectively pick one from the other, perhaps stepping onto the up escalator in such times is not such a bad idea. All gold does is sit there, yes, but it can’t be printed, so it tends to appreciate against the dollar as the dollar is debauched. Has the dollar been debauched? The Austrian economist in me thinks so. Einhorn, John Paulson, Rogers and Buffett’s commentary on US fiscal and monetary policy can’t all be wrong. Keeping interest rates too low for too long and printing too much money – what Buffett describes as “Greenback emissions” – will result in inflation measurable in the CPI in the not too distant future. (As an aside, I think there is inflation now, but because it’s not running through the CPI yet it doesn’t exist according to the orthodox view, which also happens to be the one in power, and on both sides of politics, for that matter). Jim Rogers: I don’t ever like to buy something making all time highs however I’m not selling my gold. Gold is going to go much higher in the course of the bull market. Doesn’t mean it can’t go down 20 per cent next year but during the course of the bull market it is going to go much higher it is certainly not a bubble yet. Jim you are typically a contrarian investor. If everyone is buying, shouldn’t you be selling? Jim Rogers : Yes, I should be selling at the top, but I don’t think this is the top. Gold, if you adjust it for its old highs, adjust it for inflation back in 1980, gold should be over $2000 an ounce right now. In my view, in this bull market in commodities gold will make all new highs adjust for inflation. When will gold hit 2k? Jim Rogers: I wish I was that smart. You should watch TheStreet.com. They know everything. I have previously sided with Buffett on the gold debate; of no utility, generates no profits and is thus not worth investing in. I have to say I’m slowly changing my mind. When central banks engage in their inflationary tactics of artificially low interest rates and light a fire under the prices of goods/services/property/stocks for those of us who look for value there is nowhere to hide. Even the refuge of cash is suboptimal as said inflation is busily destroying the value of the dollar as well. Perhaps gold is the answer, if gold is the storehouse of value then it would seem the place one would want to be when the value of everything is being distorted/destroyed. Pleasingly too it is a contrarian investment. Noone seems to want to invest in boring old gold in a bull market and everyone rushes to gold in the fear of a bear market. All fair, and yet, if we cherry pick dates, gold was above 800$ in January 1980, at the height of inflation panic. So in about 30 years, it has yielded about 1% per year. And this without dividends. However we paint it, the truth is that for most people, gold is a speculative investment, done for the purpose of capital gains, not for its natural appreciation (and of course, not for its cash flows). Nothing wrong with that, sure, if it not were for the need to justify the speculative claims with theories on currency debasement. A bit of honesty and self-reflection on the part of goldbugs would help here. One cannot avoid but think that they want a bubble in gold, which is likely to have disastrous effects on people who buy it late. Goldbugs could also warn of this risk at some point. The simplest analysis is that stocks grow long terms as GDP + dividends, bonds like GDP, and gold like inflation. Depending on valuation, one may be better than the others, but this depends on valuation (and possibly taxes and transaction costs), not on any intrinsic property of them. Because if we want to limit ourselves to their intrinsic nature, ignoring valuation, then stocks clearly win, unless we cherry pick dates. And finally, it is unfair not to mention that Buffett (and other people of course), cried overvalued in the stock market from the late 90’s. He did not want people to invest in the market at those prices.